Great job, prompt with quotes, punctual and if there was a delay this was communicated well in advance. My repairs was done timely in a very professional manner. Have used them multiple times and always very reliable and highly efficient service. 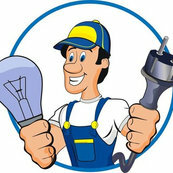 They can be contacted with confidence for your electrical needs. Sparklec Electrical did a splendid job, on time and left the workplace clean and tidy. I would recommend them with out hesitation. Very good service! He was reliable on time and good quality of work. He clean up and removed all off cuts, after work was complete.